War movies have, undeniably, fascinated film lovers the world over for as long as cinema has existed, although sometimes it gets very disturbing and emotionally draining, confronting the darkest, vicious side of human nature (i.e. in movies that focus on the brutality of warfare). One of the key reasons why audiences, in spite of not liking violence, find war movies so appealing is because such movies stir up strong patriotic sentiments. Watching on the celluloid, stories of bravery and valour of soldiers who fought determinedly against all overwhelming odds, (some of them even laying down their lives selflessly) just to ensure that the nation remains safe, evokes profound feelings of awe, love and reverence for the soldier fraternity. Thus the impact of war movies goes far beyond mere entertainment. So when a skilful filmmaker comes up with a movie based on a compelling wartime story -- depicting acts of valour by the soldiers, their strategies and tactics, their spirit of comradeship, their struggles and sacrifices and the adrenaline-charged moments on the battlefront -- backed by strong performances, it is bound to resonate with the viewers. 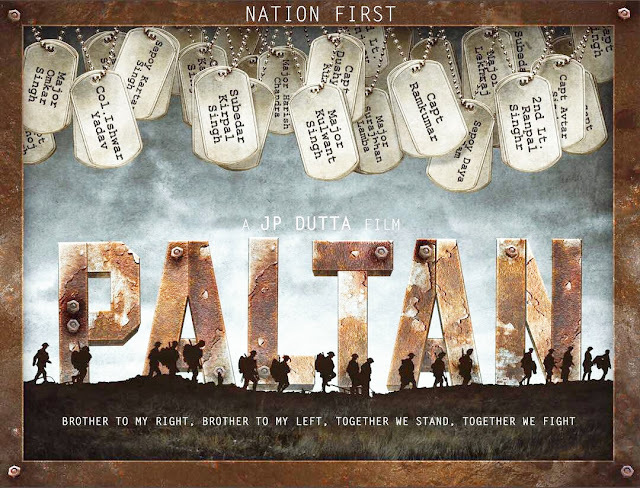 Paltan is one such movie, helmed by National Award winning Director J.P. Dutta, which is currently streaming on ZEE5. The veteran filmmaker J.P. Dutta has given us such critically acclaimed war movies like Border (1997) and LOC Kargil (2003). This time, after a long hiatus of 12 years, he has returned with Paltan, revisiting a lesser-known but an important chapter in the history of the Indian Army - about the hard-earned triumph of the Indian troops over the Chinese People's Liberation Army (PLA) at Nathu La sector in Sikkim in September 1967, thus avenging their defeat in the 1962 war with China. Paltan gives us an insight into these happenings at Nathu La in 1967 and is dedicated to the valiant efforts and sacrifices of the Indian Army Bravehearts who successfully warded off the Chinese infiltration. It may not be a perfect war movie but Paltan is nonetheless a commendable recreation of a key moment in the Indian Army's history. Featuring an impressive cast that includes Arjun Rampal, Sonu Sood, Jackie Shroff, Gurmeet Choudhary and Harshvardhan Rane among others and packed with strong performances, it is well worth the time of any war-movie lover. That apart, with several rousing dialogues like ‘Heroes don’t choose their destiny, destiny chooses them", “no guts no glory, no legends no story”, “India is an idea worth dying for”, the movie does give some goosebumps and will surely make you feel proud to be an Indian. Such movies inspire and build a sense of patriotism and therefore need to be told more often, especially to the young generation. Soldiers make a lot of sacrifices while shielding the country from external threats at the borders. They often live under life-threatening conditions away from their families, not knowing when they would get to meet them the next time or whether they would ever be able to meet them again what with the threat of death lurking around. The song "Raat kitni dastanein keh rahi hain..." penned by Javed Akhtar and sung by Sonu Nigam, beautifully touches upon this aspect. Sometimes I really wonder how the soldiers cope with homesickness coupled with long periods of boredom, apart from dealing with the constant danger of death! What keeps them going? But it is because they are guarding our nation 24x7 throughout the year that we are able to sleep peacefully in the comfort of our homes. We salute you, faujis, we shall always remain indebted to you. India is indeed privileged to have such selfless, lionhearted soldiers guarding her. Yes, Amit, such movies need to be shown to our kids more often. When I was in school, I remember watching Param Vir Chara on Doordarshan - the show based on brave army soldiers who fought for the nation. I wish our kids too could watch similar sort of shows and movies that would develop a spirit of patriotism in them. Although I am not fond of war films but the history behind those wars does make me emotional. I will definitely watch this one with my family. Regarding JP Dutta's war movies, Paltan couldn't stand up to Border. Though the story chosen is nice but I felt the build up to its climax was very slow. The length of the movie could have been shorter.